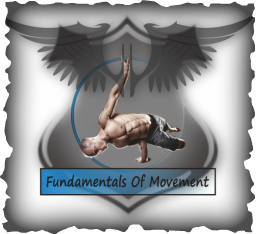 The Fundamentals of Movement principled approach sho﻿uld ﻿be a requirement for anyone that incorporates any type of movement activity in their lifestyle. It offers a responsible way to train, an approach to bypass injuries that would waste precious time while sitting at home recovering. It would work for people that are dedicated and committed to put in what it takes to see results, also great for college athletes or people with intense physical activity backgrounds, through a well-balanced and healthy practice. 1st.- Mo﻿biliz﻿ations - The training starts with Mobilizations, dissolving Fascia that get built inside our muscle fibers over night, and learning how to use and articulate use of many muscle groups in our body. 2nd.- Joint Prehab - Prehabilitating joint preparation (notice that its not rehabilitation, we do that as well but we rather prepare the joint for heavy loads before we take them on), that would build strong, resilient, bullet proof joints, soft tissues and tendons. 3rd.- Functional Strength - While getting the joints strong, we would get to work developing strength using mostly body weight, all the work is done in a functional manner, using different body alignments that basically integrate big percent of the muscles in each drill (as opposed to isolation of muscle like the common gym workouts which decrease coordination and develops imbalances), building real strength that would benefit day to day living as well as specific strength requirements for performance, this system is a progression designed to work with people at any level, and is built toward developments of skills, which are another measurement of the improvement. There is a lot of metabolic work included (weight loss), as well as flexibility, and active flexibility (functional). 4th.- Technical Skill - To top all of the basic body preparation work, we offer a variety of Technical skills that are fun to learn, and would also create a more advanced level of practice, with higher practical impacts to develop all aspects of fitness. You can find a specific list of skills we cover at this time under the 'Seminars' page. Gymnastics, Yoga, Capoeira, Wushu, Contact Improvisation, various dance forms, Tai Chi, Break dancing, Olympic Lifting, Equilibre and Feldenkrize. It provides a fresh perspective into movement, improvised or pre determined and under varying conditions, Static positioning and creation of the ability to discern efficient transitions from one position to the next. It would result in a strong, supple and well balanced body as well as an ornamental one, and would also develop ones skill at performing movements from those disciplines. The system takes time and very hard work to see results, you should calculate a minimum of 3 times a week to see progress. It would work for college athletes or people with intense physical activity backgrounds, as well as people that can see them selves willing to put in what it takes to see results through a well balanced and healthy practice.